The most surprising game was a loss of Hurricanes (2-1) in Belize City on Friday night. Hosts were defeated by Verdes (2-1) 76-65. It was a good game for American power forward Tyrone Hall (190, college: Queens, NY) who led his team to a victory with 18 points and 5 assists. 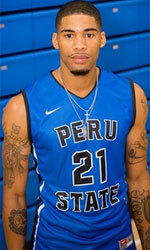 His fellow American import point guard Kris Frazier (201, college: Peru St.) contributed with 14 points and 8 rebounds for the winners. International guard Glency Lopez (-97) answered with 16 points and 5 assists for Hurricanes. Both coaches used bench players which allowed the starters a little rest for the next games. Verdes will have a break next round, and it should allow them to practice more before next game. Hurricanes' supporters look forward to an exciting derby game next round, where their team will travel locally in Belize City to the arena Defenders. An interesting game for Tigersharks (3-1) which played road game in Belmopan against Red Bandits (1-2). Tigersharks managed to get a 12-point victory 81-69. 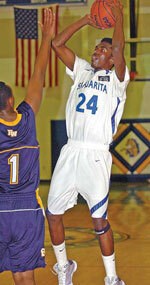 It was a great evening for center Martevuius Adams who led his team to a victory scoring 22 points and 8 rebounds. Douglas Valley helped adding 20 points. The best for the losing side was American center Jevonte Hughes (196-93, college: Charleston) with a double-double by scoring 18 points, 12 rebounds, 4 assists and 4 steals. Both coaches tested many bench players and allowed the starting five to rest. Tigersharks will play against Dream Ballers in Dangriga in the next round and it will be for sure the game of the week. Red Bandits will play at home against Running Rebels (#7) and it may be a tough game between close rivals. The game in Belize City was also quite interesting. Dream Ballers (3-1) played at the court of Running Rebels (0-4). Dream Ballers defeated Running Rebels 79-69 on Saturday. It was an exceptional evening for Jamal Kelly who led the winners and scored 25 points. Isaiah Thomas came up with 12 points, 7 rebounds and 4 assists for Running Rebels in the defeat. Running Rebels' coach rotated twelve players in this game, but that didn't help. Dream Ballers will meet at home Tigersharks in the next round and it will be for sure the game of the week. Running Rebels will play against Red Bandits (#5) in Belmopan and hope to get finally their first victory. The most impressive performance of 3rd round was 10 points, 7 rebounds and 8 assists by Daniel Conorque of Dream Ballers. The most surprising game was a loss of Hurricanes (2-1) in Belize City on Friday night. Hosts were defeated by Verdes (2-1) 76-65. It was a good game for American power forward Tyrone Hall (190, college: Queens, NY) who led his team to a victory with 18 points and 5 assists. His fellow American import point guard Kris Frazier (201, college: Peru St.) contributed with 14 points and 8 rebounds for the winners. Four Verdes players scored in double figures. International guard Glency Lopez (-97) answered with 16 points and 5 assists and forward Akeem Watters (186-95) added 13 points and 7 rebounds in the effort for Hurricanes. Both coaches used bench players which allowed the starters a little rest for the next games. Verdes will have a break next round, and it should allow them to practice more before next game. Hurricanes' supporters look forward to an exciting derby game next round, where their team will travel locally in Belize City to the arena Defenders. The game in Belize City was also quite interesting. Dream Ballers (3-1) played at the court of Running Rebels (0-4). Dream Ballers defeated Running Rebels 79-69 on Saturday. It was an exceptional evening for guard Jamal Kelly (-90) who led the winners and scored 25 points. International guard Daniel Conorque (193-91, college: Pima CC) accounted for 10 points, 7 rebounds and 8 assists for the winning side. Four Dream Ballers players scored in double figures. American point guard Isaiah Thomas (188-93) came up with 12 points, 7 rebounds and 4 assists and forward Roger Reneau added 16 points and 6 rebounds respectively for Running Rebels in the defeat. Running Rebels' coach rotated twelve players in this game, but that didn't help. Dream Ballers will meet at home Tigersharks in the next round and it will be for sure the game of the week. Running Rebels will play against Red Bandits (#5) in Belmopan and hope to get finally their first victory. An interesting game for Tigersharks (3-1) which played road game in Belmopan against Red Bandits (1-2). Tigersharks managed to get a 12-point victory 81-69. Tigersharks forced 20 Red Bandits turnovers. It was a great evening for center Martevuius Adams who led his team to a victory scoring 22 points and 8 rebounds. The former international forward Douglas Valley (194-95) helped adding 20 points. The best for the losing side was American center Jevonte Hughes (196-93, college: Charleston) with a double-double by scoring 18 points, 12 rebounds, 4 assists and 4 steals and guard Daniel Nolberto scored 20 points and 5 rebounds. Both coaches tested many bench players and allowed the starting five to rest. Tigersharks will play against Dream Ballers in Dangriga in the next round and it will be for sure the game of the week. Red Bandits will play at home against Running Rebels (#7) and it may be a tough game between close rivals.